Dennie [Denise Levertove] had persuaded me to bring out a record Charles and I made here, a year ago, to play for him [Mitch Goodman]; which we did, and clearly he was moved, by it, i.e., he got the poems as obviously the page had never given them to him. And spoke, then, of how it changed everything. These recordings were originally made available to PennSound by Kyle Schlesinger. Special thanks to Goddard College archivist Forest Davis. These recordings were originally made available to the Slought Foundation by Fred Wah. PennSound publication made with thanks to Slought and with the permission of Fred Wah and the Olson Estate. This recording is courtesy of Robert Creeley. 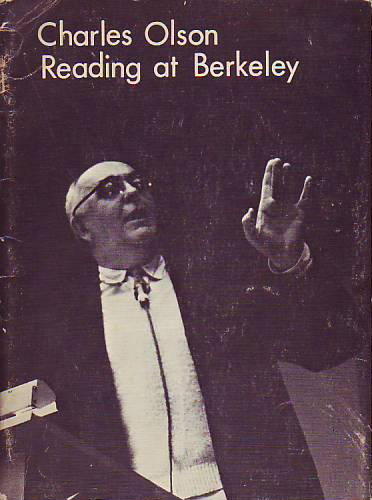 The legendary lecture was transcribed by Zoe Brown and published at Charles Olson Reading at Berkeley by Coyote Press (San Francisco, 1966). This recording is courtesy of David Levi Strauss. Event: "Ein Gedicht und sein Autor. Lyrik und Essay." Olson reads his poem in memory to Rainer Maria Gerhard, and "Maximus, to Himself." "Poetry and Truth," at Beloit College, Wisconsin. March 25-29, 1968. January 17, 2011: "Woodberry Poetry Room Oral History Initiative: Charles Olson (2010)"
December 29, 2010: "A Belated Happy 100th Birthday to Charles Olson"
May 27, 2008: "Newly Segmented Charles Olson: Boston 1962"
November 2, 2007: "Charles Olson's 1962 Reading in Boston"
October 17, 2007: "Charles Olson's 1957 Reading: SFSU"
These sound recordings are being made available for noncommercial and educational use only. All rights to this recorded material belong to the author's estate. © 2004-2007, The Estate of Charles Olson. Used with permission of the Olson Estate. Distributed by PennSound.